A humanoid robot is inherently complex due to the heterogeneity of accessory devices and to the interactions of various interfaces, which will be exponentially increased in multiple robotics collaboration. Therefore, the design and implementation of multiple humanoid robotics (MHRs) remains a very challenging issue. It is known that formal methods provide a rigorous analysis of the complexity in both design of control and implementation of systems. 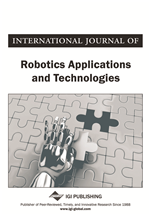 This article presents an agent-based framework of formal modeling on the design of communication and control strategies of a team of autonomous robotics, to attain the specified tasks in a coordinated manner. To ensure a successful collaboration of multiple robotics, this formal agent-based framework captures behaviors in Petri Net models and specifies collaboration operations in four defined operations. To validate the framework, a non-trivial soccer bot set was implemented and simulation results were discussed. In this section, we will introduce the fundamental concepts of an agent-based system, first. Subsequently, we will introduce Petri nets, which we use as the tool of the behavior in our integrated formal framework. Then, we briefly describe our application platform Bioloid robot kit. An agent is a dynamic responsive entity that performs actions with response to the external events automatically. In Woodridge’s (2009) definition, “an agent is a computer system that is situated in some environment, and that is capable of autonomous action in this environment in order to meet its delegated objectives” (p. 21). A MAS denotes an intelligent architecture with which the system is able to make decisions and perform actions to respond to the signal from the environment. MASs have several typical characteristics, including autonomy, perception, decentralization, and self-organization. In order to ensure that MHRSs respond to their environment, the typical first-hand information about the environment is from sensory information, which forms the resource of decision making of a MAS. Therefore, a MAS must carry the capability to handle and process sensory information properly and correctly. In order to ensure a MAS performs correct functions in response to the environmental stimuli, the behavior and control in each component play a major role towards the completion of the mission.